* The sound design. There is barely a moment that isn’t underscored by an unsettling noise… a mechanical hum, pouring rain, something grinding, the hiss of a radiator. * Speaking of sound design, how about when Henry enter Mary’s home and there’s a few disturbing minutes before you find out where that infernal squeaking is coming from… a litter of puppies nursing in the corner. * And speaking of that, the way the film handles fear of parenthood. Although Lynch has said that no one has ever interpreted the film the way he meant it, it’s impossible to write off fear of parenthood as a dominant theme. Fear of not caring enough for your children, and fear of doing the wrong thing and destroying them. We are supposed to have a biological imperative to reproduce, but I think most people could relate to these fears. 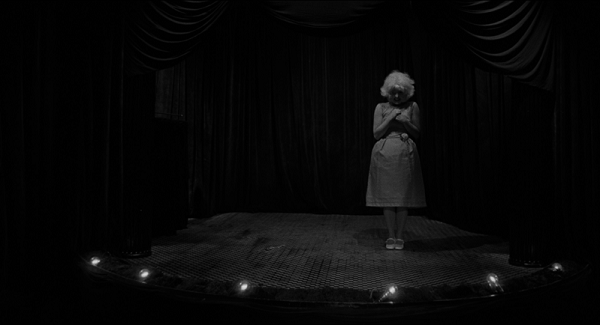 * And that makes me think of the way Lynch reacts to human biology in general. There’s a fascinated repulsion to it, an emphasis on how… well, gross we all are, once you really start thinking about it. Perhaps what’s most unsettling about the “baby” is not how different it is from us, but how alike it is. * Oh, that baby! What a marvel of production design and special effects! * The use of the music, namely the incongruous Fats Waller organ ditties and the memorable “In Heaven” serenade. * The comedy. For a film that’s so bizarre and gloomy, it sure is funny. There’s just a handful of lines spoken, but most of them are quotable gems. “OKAY, Paul!” “Look at my knees!” “Oh, you ARE sick!” And that silly grin on Allen Joseph’s face during the hilarious dinner scene. Pure gold. * The decrepitude of the surroundings and masterful set design. Everything is just the right amount of dirty and falling apart and fucked up. The insane plant on Henry’s nightstand or the pile of what appear to be pine needles around his radiator. The peeling wallpaper. The desolate landscapes. The grimy window at Mary’s house. * That part where Mary is tugging on the bed and you don’t know what the hell she’s doing. * Trying to figure out what’s real and what’s a nightmare, or if there’s a difference. Puzzling out the meaning of the Man in the Planet (Henry’s lifeforce?) or the titular sequence or the little worm he finds in his mailbox. Sometimes I think I have a grasp on these things, sometimes I feel the significance of them without understanding them, sometimes they just come off as dreamlike imagery. But always they are fascinating and add to the grand experience of it. This entry was posted on December 3, 2014 at 4:25 pm	and is filed under Movie Reviews. You can follow any responses to this entry through the RSS 2.0 feed. You can leave a response, or trackback from your own site.